This famous Scottish clan surname, which six hundred years after its creation, gave its name to the Chisholm Trail and the opening up of the American West, is locational. It derives from the lands of Chisholm, in the parish of Roberton, in the county of Roxburgh. Early Chisholm (the name is also recorded as Chisholme) name holders formed part of the famous Scottish raiders called ' The Border Reivers', who ranged as far south in England as the city of York. For reason unclear, over the centuries some of the 'Chisholms' moved north in Scotland, and in effect two separate clans developed, although there seems to have been little to choose between them for their general contempt for the law. The Gaelic form of the name is 'Siosal', and collectively the clan is called 'An Siosalach'. Amongst the early name holders was Robert de Chesholme, who was sherrif of Inverness in 1359, and also custodian of the castle of Vrchard. In 1499 certain persons (un-named) were executed for the killing of one 'Harrald de Schlescheme', of Strathglas, although the circumstances are far from clear. Walter Chisholm of that Ilk was the Bailie of Melrose in 1605, and the Chisholms of Cromlix went against all the clan tradition by being bishops of Dunblane in the 16th century. 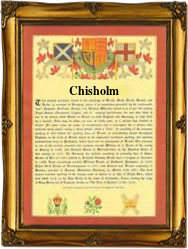 The clan chief is known as 'The Chisholm', and the coat of arms is a wild boars head in gold, on a red field. The first recorded spelling of the family name is shown to be that of John de Cheshelme, which was dated 1254, the papal records of Pope Alexander 1V, during the reign of King Alexander 111 of Scotland, 1249 - 1286. Surnames became necessary when governments introduced personal taxation. In England this was known as Poll Tax. Throughout the centuries, surnames in every country have continued to "develop" often leading to astonishing variants of the original spelling.